My youngest is quickly approaching his first birthday—which means he's still in the “stick everything in my mouth" stage but is also very eager to learn new things. One thing I'm learning this second time around is that babies really don't need a lot of toys to stimulate them. My little guy is much more interested in an empty cardboard box than, say, a new toy with all the bells and whistles. I'm often amazed by the senses that babies start to use at this age, especially the sense to “touch" and “see" things. They really start to focus and explore objects, so I want to provide him with adequate crafts and activities that allow his little mind to soar! 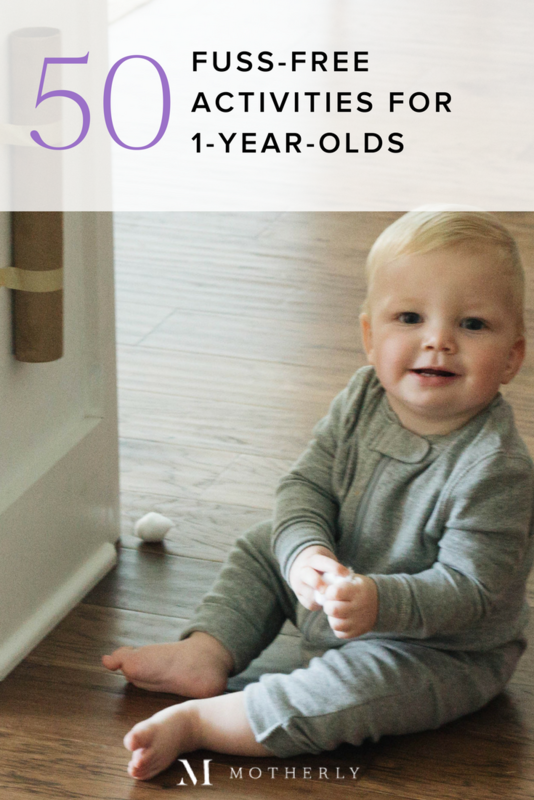 That being said, here are 50 perfect for 1-year-old minds—with the added benefit of being super easy for moms to put together. 1. Discovery basket: Fill clear plastic containers you have around the house with little things that baby can explore. Place a lid on them, tape the lid if need be and let the little one spin them around to explore the contents. 2. Paper towel holder and cotton balls: Tape a cardboard paper towel roll to the wall and encourage baby to drop some cotton balls into it. They will catch on and have fun! 3. Mess-free canvas art: Pick up a canvas from your local craft store, dab a few different colors of paint on it, wrap it in plastic wrap and let them push the paint around with their fingers. This little craft is safe, an easy clean up and a great new piece for the living room gallery wall! 4. Water bottle shakers: Empty water bottle (drink up!) and then fill it with popcorn, rocks, rice, etc. Tape the cap on to be extra safe and you've got a homemade rattle. 5. Hand and foot painting: There are so many fun handprint and footprint animals you can make with your little ones' hands or feet. Plus, it's a fun new sensation for them. 6. Mess-free painting: Fill a ziplock bag with some different types of paint, seal it up, tape it to the highchair, floor or table... And let baby push the paint around. Best of all, you can put it away and pull it out again for another day's entertainment. 7. Water painting: Let your little one paint a masterpiece on some colored construction paper with water and a paintbrush. Bonus: The cleanup is simple and easy! 9. Sensory bottles: Add a few drops of food coloring to water bottles along with glitter and knickknacks like beads. Tape on the top and watch as your little one is amazed by tipping the bottle around. 10. Cereal necklaces: Let your little one string some Cheerios onto a piece of yarn and create a little necklace. This activity is great for fine motor skills! 11. Sand doodles: Take a small box, draw some squiggly or straight lines on the inside, pour sand over it and encourage your little one to trace along the lines. 12. Music makers: Take an empty tissue box, wrap a few rubber bands around it and you have a makeshift harp! You little one will love plucking the rubber bands and listening to the sounds that come out. 13. Sorting balls with a spoon: Set out two bowls and fill one bowl with ping-pong or golf balls. Then let your little one work on transferring the balls with a slotted spoon to the empty bowl. This is a great activity for hand-eye coordination and fine motor skills. 14. Sticky note peek-a-boo: Print off some pictures of family members and put a sticky note over the top. Then encourage baby to play “peek-a-book" with the relatives! 15. Handprint keepsakes: Ornaments, wreaths, canvases… capture those sweet little hands and toes while they grow. You'll look back one day and be glad that you did! 16. Sock puppets: Grab a few old socks, draw faces on the tops with a fabric marker and have a puppet show with your babe! You can let them slide the socks on their hands to use, too. 17. Paper window mosaics: Tissue paper and press-n-seal food savers make for great window mosaics. Cut up some pieces of paper, craft a mosaic and stick it to a window that gets a lot of sunlight. Your little one will love watching the colors shine through the house. 18. A life-size portrait: Most home office stores print large, life-size photos for just a few bucks. Print one of your babe, hang it on the wall and encourage them to explore themselves and find their eyes, nose, etc. 19. Cardboard tunnel: Save those Amazon boxes and craft a tunnel for baby to crawl through. 21. Whipped cream painting: Spray a little whipped cream on a highchair tray or table and let your little one paint pictures in it. 22. DIY ball pit: Pull out that plastic pool and fill it with inexpensive plastic balls—or use your pack 'n' play! Either one will do the trick and keep baby entertained for hours. 23. Polkadot sticker art: Using labeling “dot" stickers, let baby create a masterpiece by sticking stickers to a blank piece of paper. They will love figuring out how the stickers work. 25. 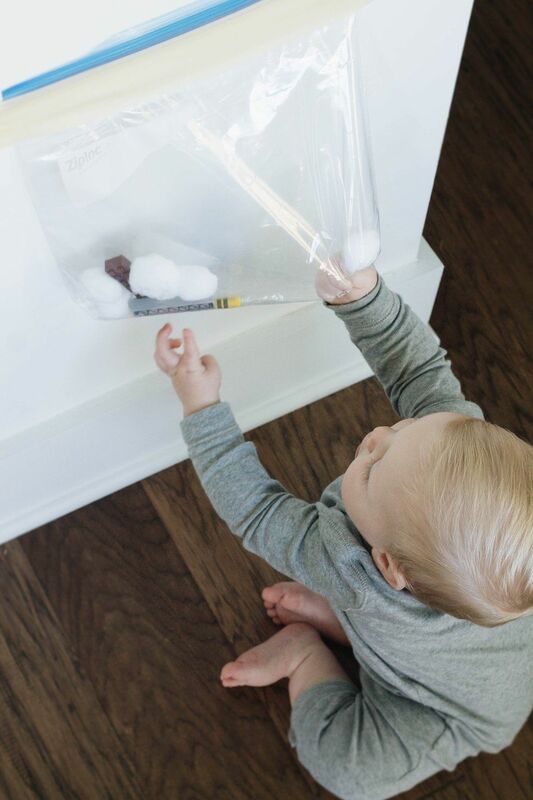 Touch-and-feel board: Cover a poster board with different types of things that baby can touch, such as fake fur, sandpaper, bubble wrap and aluminum foil. 26. Plastic egg play: Put those leftover plastic Easter eggs to use by taking them apart and stacking them—and then encouraging baby to try, too. 28. Sort toys in muffin tins: Place an assortment of different balls into muffin tins and let baby play with them. Colored cotton balls are especially fun for older tots interested in sorting by colors. 29. Bottle peek-a-boo: Put a rolled-up piece of paper in an empty water bottle so it covers the bottom portion. Then, stick a cotton ball or rock through the paper roll and show baby how the ball appears when you lift up the paper. 30. Clothes pin drop box: Cut a hole in the lid of an empty coffee can that's big enough for a clothes pin to go through. Then place the lid on the empty tin and show baby how to place the clothes pin inside. Get their little minds thinking by asking questions like, “Where did it go?" 31. Texture walk: Help your little one take a grassy nature walk with bare feet—or bring a few crunchy leaves inside to let them stomp on. 32. Spaghetti play: Boil a package of noodles, cool and let baby play with them. Go ahead and join in on the fun, too… Who doesn't love to play with noodles? 33. Kitchen rock band: Let baby safely explore your kitchen by setting some different utensils and bowls on the floor to explore. My little guy loves measuring spoons, spatulas and plastic bowls! 34. Pretend animal play: Show baby pictures of a few different animals and then act out their sounds and motions, such as a cat meowing and licking her paws. 35. Ring some bells: Browse through your holiday décor for some bells and let the little ones ring away! ? 36. Vegetable peel play: While making dinner, let baby play with those leftover potato, zucchini and carrot peels. They will love the different textures and fragrances. 37. Tub drums: Flip over a few tubs or buckets and you've got some makeshift hand drums! 38. Hanging loofas: Grab a few loofas from the store (they are dirt cheap) and string them on some yard. Then hang them off of a table or the handles of your refrigerator to let your little one bat at. 39. 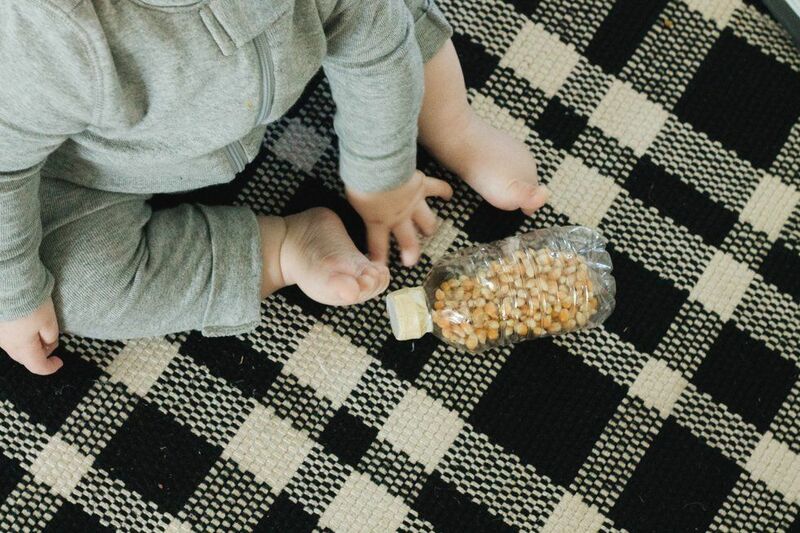 Sensory bags: Sensory bags are a great way to let babies explore and safely touch things that they normally couldn't because of chocking hazards or the simple mess factor. I usually toss things like cotton balls, crayons and other textured items into a plastic bag, zip and tape the top and then tape it to a wall. This leads to hours of entertainment! 40. Noodle necklaces: Similar to cheerio necklaces, but not edible—and work a slightly different fine motor skill with the stringing. 42. Snow globes: Using small jars or bottles, glue one of your baby's small animal trinkets upside down to the lid, fill the jar portion with water and glitter and place the lid back on tightly. You now have a homemade snow globe! 43. Stringing pipe cleaners: Poke holes in an old egg carton and stick the pipe cleaners in it makes a loop. Baby can pull these out, place them back in and so forth. 44. Magnetic tubs: Fill a small plastic container with things that are magnetic—such as washers, bolts, etc. Place a lid on it and tape it up really well. Then, using a magnetic stick, let them pull the different things around the container safely! 45. Edible slime: There are tons of edible slime recipes that are baby-safe. Make one and let your babe have some fun. Who doesn't love slime?! 46. Foam window letters: Those foam bathtub letters also work great on windows—and baby doesn't turn into a prune to use them! 47. Busy board: Grab some latches, zippers, locks and anything else that you could place on a wooden board for your little one to safely explore. Busy boards make for awesome little homemade gifts as well. 48. Touch and feel frames: Using empty frames, remove the glass and tape sensory objects to the back portion of the frame. Great items to use are sponges, dusting cloths, sandpaper, bubble wrap, etc. Place the frame back around it, close it up and TA-DA! 49. Bathtub painting: Stick baby in a water-free tub with some washable paint and let them get creative. When they are done, rinse the bathtub out and give them a quick wash.
50. Busy basket: I use a busy basket almost every day with my little guy. I keep it tucked away so when I pull it out, it's all new and fresh to him. It's filled with odds and ends, such as blocks, baby-safe kitchen utensils, sensory bottles, music makers and more. The beauty of these activities is that they promote brain-development, let baby have fun—and usually give mama a few moments to have her hands to herself!